Settings, stones, sets, and solitaires - it can be easy for anyone to get overwhelmed when shopping for engagement rings. 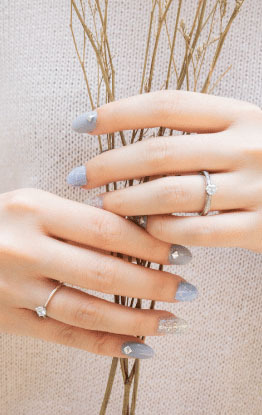 Fortunately, we've broken down the process to make it simple for you to find the perfect engagement ring for your fiancé-to-be. It used to be a set rule that an engagement ring should cost what you could earn in two months, but that's an old-school way of thinking. Simply buy the best ring you can afford without going into major debt. So, establish your budget- you ought to get the best for her but you need to make sure that you don’t break the bank. Rest-assured that at Michael Trio, we will work around your budget to find you the perfect diamond and setting to accommodate you budgetary limits along with your personal taste. The hard part about shopping for women is that you rarely know what they want. In terms of engagement rings, women want their rings to be big and sparkly. Understand your lady's standard definition of "big" (weight of diamond) and also consider her tastes and lifestyle. You may bring her window shopping to get a feel of her preference. If you do not wish to spoil the element of surprise by bringing her for window shopping, you may want to ask her friends/mother if she has mentioned a preference for a particular type or style of ring. At the same time, it is important to find out her ring size at this stage which may include some James Bond actions/planning if you wish to find out her size without her knowledge. At Michael Trio, we have a section here to educate our visitors on diamonds (4Cs,diamonds certificate, etc). If you find the information overwhelming to understand, you may call one of our diamonds consultants at (65) 6299 0110 to help you. It is important to have these knowledge to make an informed decision. After working out your budget, calculated her ring size and gathered all background knowledge of her tastes, preferences and lifestyle, you are now in a much better place to choose the right style of setting for the unique diamond. It is important to choose the right setting because the right setting will highlight and enhance the stone’s best feature. An engagement ring is typically made of a precious metal upon which at least one gemstone is set. Four popular categories of ring settings include the classic solitaire, a fancy setting with side stones, a matching bridal set and halo (framed setting). When you choose the ring setting that the diamond will be mounted in, you may want to consider the wedding band and how it will look with the engagement ring. The simplicity of the solitaire setting makes it a timeless and classic choice. A solitaire setting with four prongs allows the most light to enter the diamond from all angles, maximizing its brilliance. Six prongs shows slightly less diamond, but provide slightly more security in holding the stone. This setting is best for stones with good symmetry and perfect cut. It is a safe bet when you're not sure which style you want. It is also typically the least expensive way to set a stone. Browse through our classic collections here. A fancy setting with diamond side stones adds an extra sparkle to your ring, complementing your center stone. The side stones are set evenly with the band in a channel setting, bar setting or with prongs. The purpose of the side stone is to visually connect the center stone with the shank or to cover the width of the ring so that the plain part of the shank is not visible when viewed from the top. In respect to finger size, it's a very good choice for larger sizes. For those with smaller fingers, the setting must be chosen very carefully. The wrong choice might result in a ring that looks not proportion to the finger. A bridal setting is comprised of an engagement ring setting and a matching wedding ring to create a perfect fit and uniform look. Bridal sets come in classic solitaire settings or include diamonds. This also allows men to be more creative and personal in their own choice of a wedding band. Michael Trio offers 2 types of wedding rings: with and without diamonds. The plain wedding band holds its own appeal to those who feel an affinity for tradition and history. A wedding band without diamond does not necessarily lose out to one with diamonds too because we use a variety of finishing and texturing to bring life to a simple band. Michael Trio offers wedding bands in white gold, yellow gold and rose gold (18 karat or 14 karat) to suit a variety of tastes and preference. Be it clothes, bags, shoes or jewellery, women are always spoilt for choices. Michael Trio offers the variety of wedding rings for women. Simplicity at its finest, a classic ring that will never go out of style. Retaining its quality as time flows . Michael Trio offers you the choice to customise your own ring design to suit your style and preference. Our team of designers will guide you along in your journey of creating something which no one else will have the same. We offer engraving services and couples can choose to have hidden messages/symbols engraved on the inner band of the rings, an intimate secret only known to both of them. Contact us today to discuss the possibilities and options of creating something unique to both of you. Michael trio makes it simple to order a ring in the proper size. Michael Trio will resize your ring free of charge for you within the first 60 days of purchase. However, take note that for eternity rings and tension rings cannot be resized and has to be completely remanufactured. That being said, it is important to order the correct size at the time of your original purchase.